Paulding County, Georgia has an ample amount of beautiful acreage. Case in point: Celestial Breeze Subdivision offered by Virtual Properties Realty in north-central Paulding. 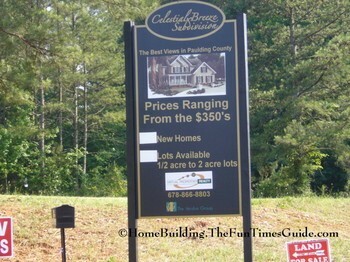 We were on one of our home touring excursions recently and were literally just going where the little realty signs on the side of the road were taking us…through the high country of Paulding County. This is about as good as it gets here in our little part of the world…home touring-wise. We were traveling down state route 61 and quickly came upon (and passed) an entrance to a subdivision. We thought nothing of it because we had not previously seen any signs advertising the subdivision itself. But when we drove by I caught a glimpse of a large part of Paulding County. Time to put the brakes on and turn around to see what this is all about. We pull in with great anticipation as we pass the entrance sign picturing beautiful homes offering ‘the best views in Paulding County’. Man…what a disappointment! This is a little story about the subdivision… that wasn’t…at least for now. The way that growth is occurring in our area, though, it won’t be just a great view for long. You’d better believe it! This is virtually a reality at this point. There are 27 lots available ranging in size from .5 – 2 acres. Maybe one day Virtual Properties Realty will see it through to its’ completion and we’ll be there to get a first look, but for now it’s a just great little overlook. Looks like Virtual Properties Realty is looking for investors and builders to take over from here. If you’re interested in a little slice of country heaven in NW Georgia then come have a look. It’s there for the taking, y’all!